From the very beginning, staying focused from the distractions that were the amazing vistas all across StoneCrest Golf Course would prove an imposing task. 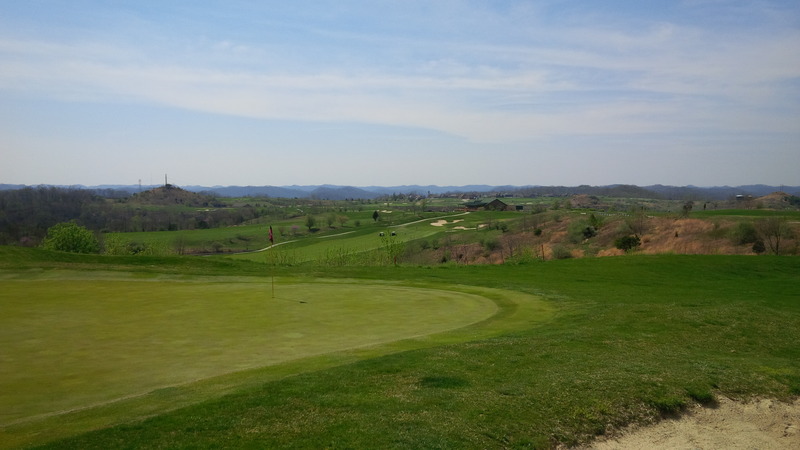 StoneCrest Golf Course in Prestonsburg is a less than two hours from my home inside New Circle Road in Lexington, but arriving at the clubhouse gave me a sense I’d entered a whole other world. The trip required a two-hour journey to the foothills of the Appalachian Mountain Range. 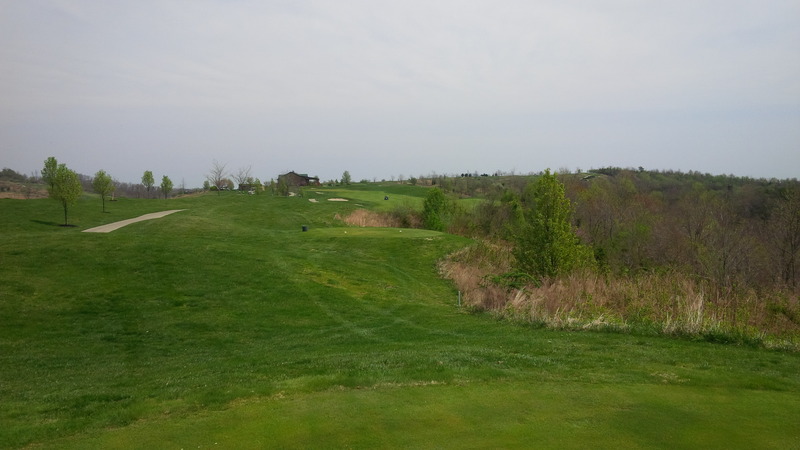 After playing the course, I’d drive twice as far just to play it again. 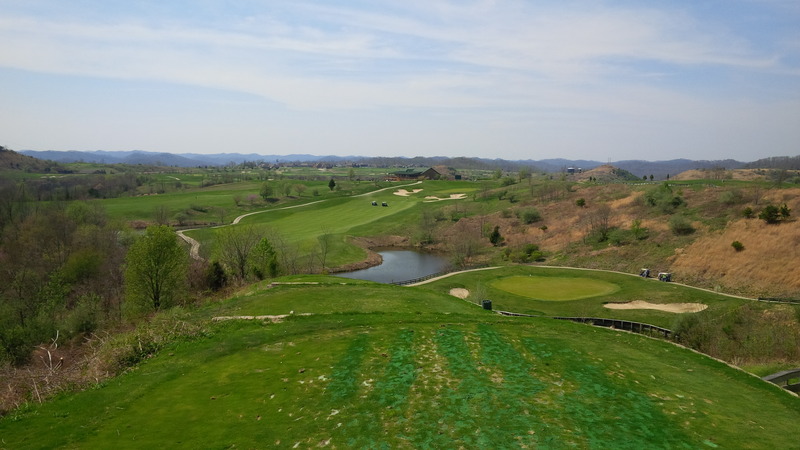 Playing five of the top public courses in Kentucky in a single season was an ambitious preseason goal for my golf game and my friends’ patience and goodwill. However, if the rest of the trips go as well as the jaunt to StoneCrest, then this may well be the best idea I’ve had in years. From the tee, the 17th green (to the right of the lake in the picture above) sits adjacent to one of only two bodies of water on the entire course at least 50 feet below the tee. Elevation was the central theme of the day. The official elevation for downtown Prestonsburg, KY is 633 feet above sea level, which is roughly 300 feet below Lexington’s elevation. At first blush, this is incredibly counter-intuitive, since were surrounded by mountains at every turn in Floyd County. However, Prestonsburg abuts the banks of the Levisa Fork, a tributary of the Big Sandy River, which runs between some of the highest mountain ridges in Floyd County, Kentucky. 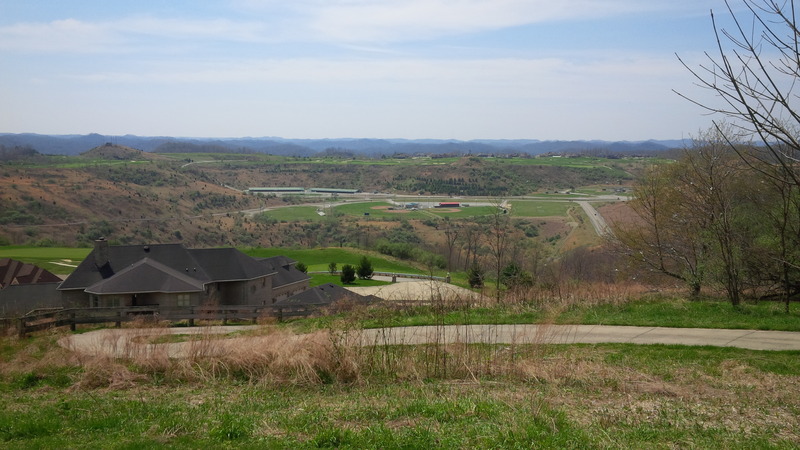 According to the United States National Map, the elevation of the StoneCrest Clubhouse, which is literally just a couple of long par 5’s from downtown Prestonsburg, measures at 1,295 feet. The 13th tee box, which looks and feels like the highest point of the golf course in person, sits at 1,349 feet, with stunning views of the mountains and horizon in three directions. Unless the wind is perfectly at your back, reaching the 2nd green in two would require a carry of 260-275 yards to avoid all mounds and bunkers guarding the green. 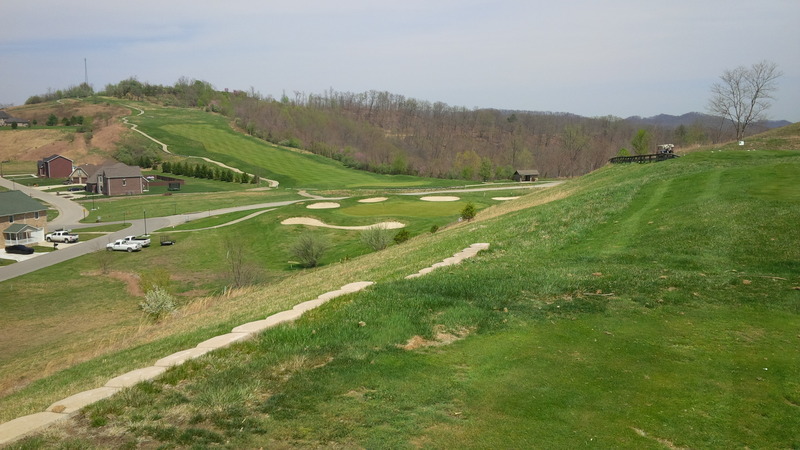 Designed and built by Chris Chrissman and Jack Sykes, in consultation with Kentucky Golf Hall of Fame member Russ Cochran, the course was built on a mine reclamation site, opening for play in 2001. StoneCrest plays to 7,011 mountainous yards from tips. 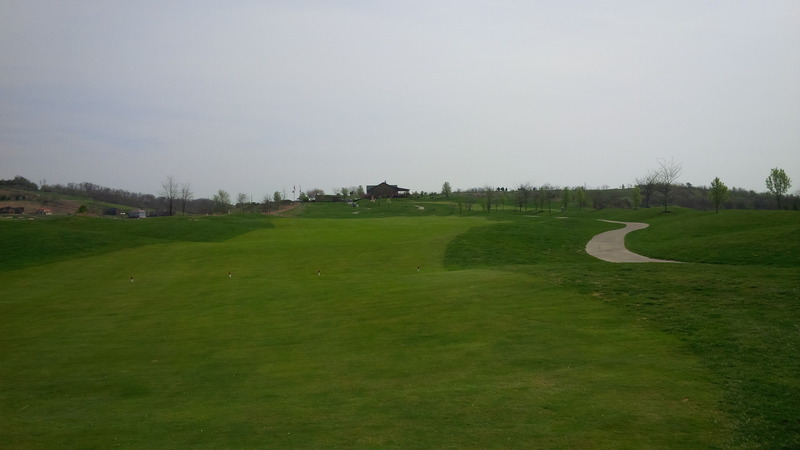 However, as this was Bryan’s first round of the year, he and I played from the much more accommodating blue tees. 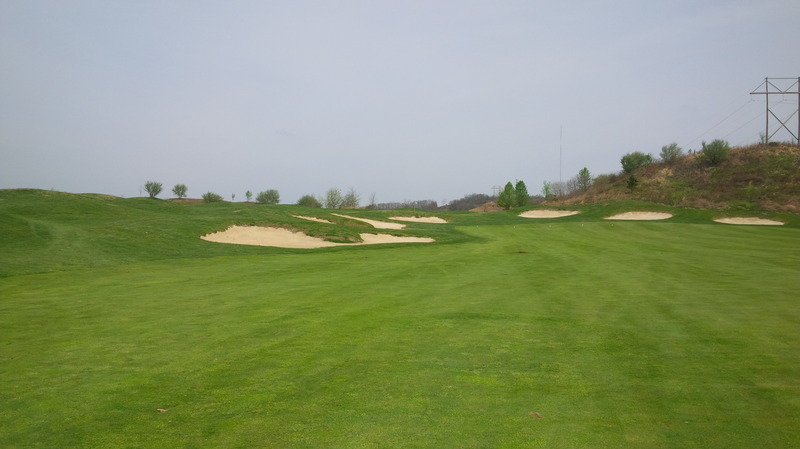 Despite only playing to a slope and course rating of 124/70.8, at 6,475 yards, the golf course is not quite equal parts challenge and opportunity from the blue tees. The front nine played much more difficult than the back. While only 69 yards longer than the back nine, the layout of the front incorporated many more hard angles from the tee, requiring the golfer to pick the correct target, either in the fairway or on the horizon, to match the distance of his drive. While aesthetically stimulating, I had no idea how to calculate the playable yardage of StoneCrest’s precipitous drops in elevation like this gem of a shot from the elevated 3rd fairway. The width and depth of the fairways varied throughout the course, alternating between inviting and mortifying. 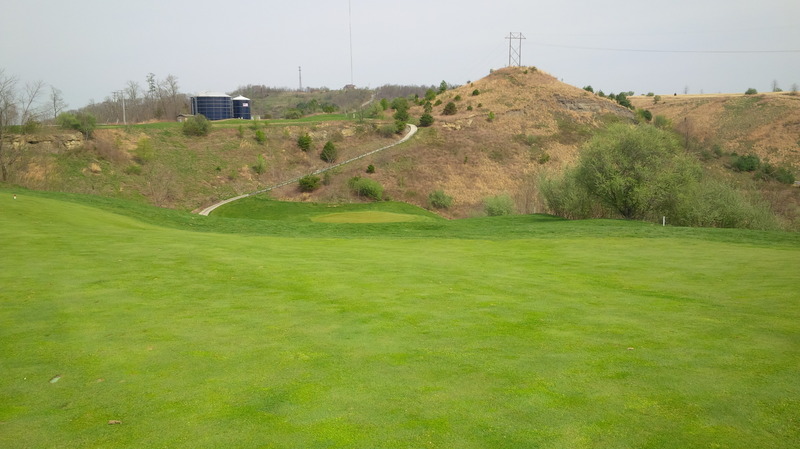 Despite being set atop a mountain ridge, StoneCrest actually plays on and across the plateaus of a mountaintop removal site, so there was surprisingly little lateral tilt to the fairways. So, if you could find the fairway off the tee, you were generally afforded a scoring opportunity. However, overshoot or miss a fairway sideways, and chances are you are left without a view of or a chance to reach the green. 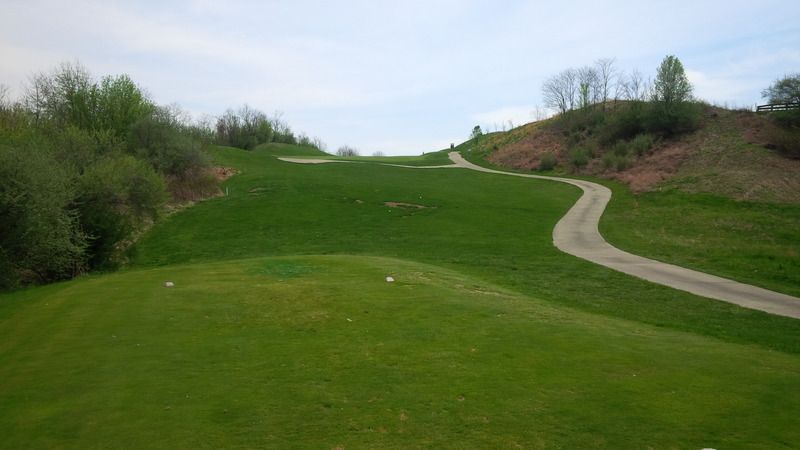 The course architects really used elevation change as the major feature of StoneCrest. Three out of four par 3 holes utilize tee boxes positioned far above the elevation of the green, with both par 3’s on the back nine having drops of no less than 50 feet. This pictures don’t do the slopes of StoneCrest justice. Here, on the 4th green, the cup 20 feet away is at least 2-3 feet downhill from where I was standing. I specifically remember hitting a high gap wedge with a slight draw and a lot of spin into the 6th green, and the ball rolled 25 feet left after impact. While initially intimidated by such fast, firm putting surfaces, as the round progressed I found the greens very consistent and supported a true roll. After 5 or 6 holes, I’d figured out the green speed, or at least the proper lag speed. Of course, this didn’t mean that I putted well all day, but I ran a lot fewer by the hole on the back nine. The visual from the 9th tee is a prime example of why the front nine plays incredibly difficult at StoneCrest: Where in the world am I supposed to aim this drive? On the 10th tee, Bryan and I talked to a few super friendly and gracious locals who were charter members at StoneCrest. To a man, each said that the greens we played on were the fastest they’ve ever been in the courses 13 year history. They informed us that the front nine greens had been aerated and top-dressed already, but that the staff had not yet punch the greens on the back nine. Honestly, I couldn’t tell a difference. The golf course’s greens varied between gargantuan and just average in size, with some very deep, some shallow but very wide. Several greens were sculpted around mounds and bunkers, while others were just the logical conclusion to the fairway. 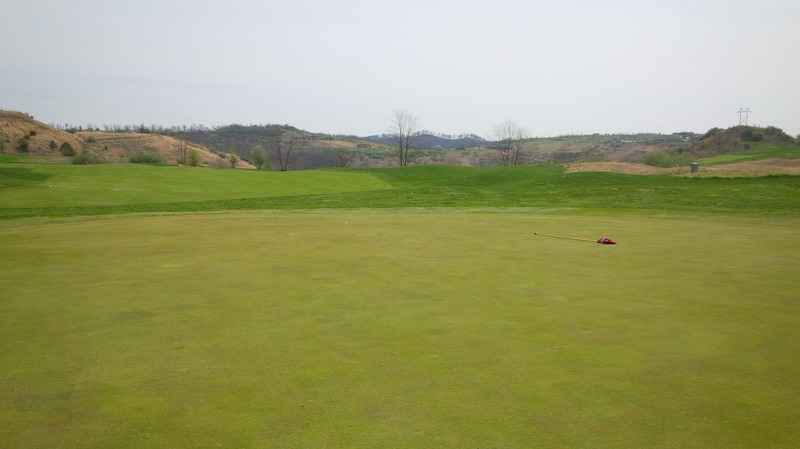 Most greens had multiple levels, but the undulations fit the rest of the course and didn’t feel hokey or forced. At 154 yards, the 50-plus feet of elevation change between the 11th tee and green make for a nervy short iron shot. The greens’ design variety was a nice, value-adding feature of the layout. I was never bored with the golf course. I’d suggest that if the greens are going to remain that fast permanently, it might justify a course re-rating by the USGA. Smartly, I think, several of the fairway and green-side bunkers had their sand removed and now played as grass bunkers. Obviously, these were less hazardous than their predecessors, but the increased playability really didn’t diminish the value of premium shot-making. So many courses in Central Kentucky contain bunkers that are, at best, equal parts mud and sand, or that lack proper drainage capabilities. The inevitable result is that the maintenance staffs can’t keep such bunkers in playing condition. I would argue that grass and waste bunkers are underutilized in general in Kentucky, as I was perfectly content with StoneCrest’s strategic compromise. The ProShot GPS on our cart alerted us of when the coast was clear to hit our blind tee shots on the uphill par 5 14th hole. My ball did manage to find a bunker on the one par 5 I tried to reach in two, and I managed to reach the green and two-putt for par. The sand was in fair to good condition, given our extended winter and the amount of rain and snow the course must have endured recently. Luckily, that was my only sand bunker experience on the day; Bryan wasn’t so lucky. I have no confidence that I’m actually more athletic or a better golfer than Bryan, but I do play a lot more golf than he does. He has a wife and two young children, I have The Wife and Birdie, the dog. So, I have started scoring better than he the last few rounds we’ve played. To keep things interesting between us, Bryan and I have developed a standard bet for our golf rounds that I rather enjoy. After we total up the scores from the front nine, I spot him the difference between our scores for the back nine in a high stakes, winner-take-all wager. By the time we reached the 16th green, the amazing views of the course and surrounding mountains had almost become ho-hum…almost. Sometimes it may be as little as a couple of strokes. On Sunday, with Bryan knocking off the long winter’s rust on the front side, I had to spot him 15 strokes. To his credit, Bryan really started to find his swing on the second nine, so I had to buy the post-round Gatorade. Despite the soul-crushing defeat, I was really happy with the way I played. I drove the ball amazingly well considering I’m just a couple of months into my swing redevelopment. I missed all my birdie putts on the day, badly, but at least I had birdie putt opportunities. Beyond the amazing golf course, StoneCrest delivered some other fun and memorable features that left indelible memories of the trip. The clubhouse was larger than I expected, complete with an assortment of clubs and apparel available for purchase. The clubhouse included patios or porches on all sides, which afforded the golfer tremendous views of the course and surrounding mountains. My chicken salad sandwich at the turn was fantastic, and Bryan raved about his cheeseburger. The new bar in the grill room was impressive, with a shelves full of practically any drink, alcoholic or otherwise, that the thirsty golf may require. StoneCrest has just recently installed Proshot GPS systems on their carts, and both of us were impressed with its performance. It was maybe the most accurate golf course GPS system I’ve encountered with respect to distance. There were no illustrations of the hole, but system does provide measurements to carry trouble off the tee in addition to front, middle, and back of the green yardages. We also learned from the members that the GPS systems essentially act as low-jack tracking devices, alerting management if some miscreant diverts a cart to a non-golfing purpose or decides to park next to the green. There’s nothing “natural” about a mountain top removal reclamation site, but StoneCrest’s developers really got it right with their golf course and the amazing scenery it affords its guests. For the first time that I can recall, I heard a wild turkey calling in the underbrush next to one of the greens on the front side. Also, while on the 12th green, we heard someone taking target practice with a high-powered rifle in the valley below. While a little disconcerting, apparently no one else thought there was anything weird about such an observation. My overwhelming memory from this trip is that StoneCrest Golf Course is a championship track. It was a windswept but warm, pretty day. More importantly, it was a great time spent with a good friend. Even if it rains on the rest of the “KY’s Best Golf Tour,” my experience Sunday would mean the entire scheme was a success. Prestonsburg sits squarely between East Jesus and NoWhere Special, but StoneCrest is worth the drive, no matter how far away from home it is. And I can’t wait to do it again.